Ready for a magical experience in Mexico? 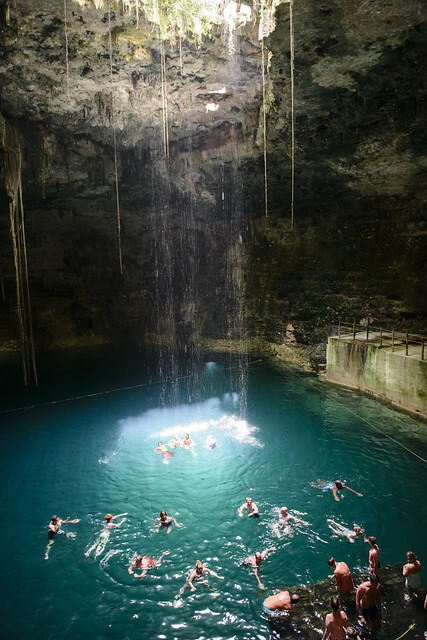 If so, then there’s nothing better than swimming in a cenote. Chances are if you are traveling to explore the Yucatan, then you will be arriving in Cancun…and there are plenty of Cancun cenotes just waiting for you to jump in to cool off! The Yucatan Peninsula is blessed with some incredible cenotes all over, including cenote Ik Kil near Chicken Itza or Gran Cenote just near Tulum. Having experienced both, we highly recommend them! But there are so many cenotes to be experienced, even some with zip lines and snorkeling deep into the caves of the cenote. With so many cenotes around the Yucatan, we wanted to highlight some of them by the closest major city that you would be staying in. Cenotes, came from the Mayan word “Dzonot” means “sacred well” in English. A cenote is basically a lake found underground, due to cavernous limestone rock — which is what the entire Yucatan is made from! To the ancient Mayans, these water filled caves were held sacred as a place of worship. They served both as a fresh water source, and they also believe that they led to the underworld…so they would also make sacrifices (hopefully not in the same cenote where they drank!). Looks like a great place for a swim, right?!? Nowadays, many Cancun cenotes and others all around the Yucatan are ideal for swimming. The water is fresh, crisp, clean and quite cool – very refreshing after a hot day exploring the area. Some of the nicer ones have lighting, ropes, and paths to help you enter and exit. While some are completely closed off (like a giant closed cave), others have small or large openings in the top where rain water may flow in. Overall, cenotes are fabulous places for a refreshing dip! ** NOTE: Some Yucatan and Cancun cenotes are not really advertised to the public and can only be found by cardboard cutout signs from the road . The great thing about lesser advertised cenotes are that they are peaceful and less crowded; however, they are harder to find. We’ve listed some of the more popular as well as some of the lesser known cenotes here in this post. Xenotes Oasis Maya is a park located right on the coast. You can experience 4 different types of cenotes here where you will be able kayak, zip-line, inner tubes for relaxing, and you will also be able to repel and do a little snorkeling. If you want to can acquire a private guide for your full day of adventure. 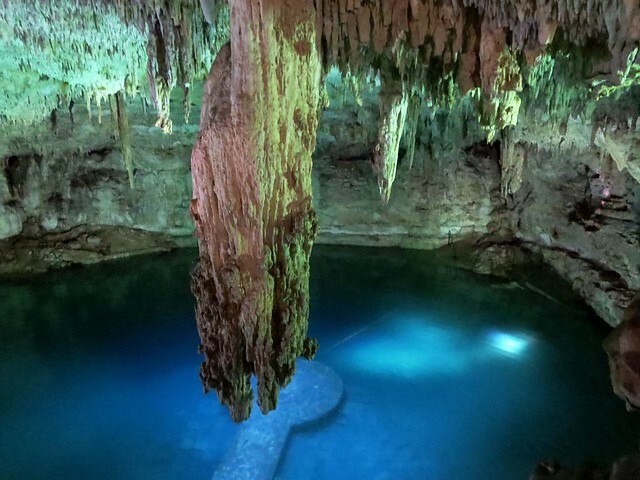 Easily one of the most popular cenotes in all of the Yucatan, or even Mexico, is Ik Kil. If you are traveling and staying in Cancun then you will signs all pointing to this cenote if you head out toward Chichen Itza. Be prepared to share it with numerous tour groups during the day, unless you are staying close at the amazing Mayaland Resort – then you plan to arrive early before the tours arrive or stay late after they leave (as we did). It is worth the visit and swim though – because it is big and the water is fresh (although quite deep). Great diving to be had here, but you had better be a good swimmer! And keep in mind that all all swimming is at your own risk. It’s hard to know that Cenote Yokdzonot is here. There is another famous cenote which is just a 10-minute drive away from the Mayan pyramids of Chichén Itzá, but the wonderful Cenote Yokdzonot is just another 10 minutes beyond that, just enough for the tour buses and crowds to have disappeared. Just follow the signs from the road. Often you may be the only ones swimming at Yokdzonot, or with just a few other swimmers paddling around with the small fish below you. You wouldn’t want to miss the wonderful sight of the Mayan underground wonderland just because you are not a fan of swimming or fancy tight spaces. Grutas (caves) offers you cenote views without getting wet. The Grutas de Loltún is the largest caves in the Yucatán Peninsula offering a unique path via the inner world of Mexico monumental ceilings. While it’s technically not a swimming cenote, it is interesting to explore this underground cave system. Dos Ojos meaning “two eyes” describes this cenote’s two diverse pools. One is blue and clear and great for snorkeling, while the other dark and cavernous and great for cave diving. They are both well-kept but the black eye cenote receives the highest attention due to its virtually light-free snorkelling. At this wonderful cenote, you can also take a walk through dry caves to catch the excitement of the bats snuggling among the stalactites. No crowds and elaborate extras at Cenote Azul, only local ambience. Moving straight along the clean turquoise water gives a view of the tropical fish darting below. Below the surface is an amazingly blue world for divers to see and explore. Historically, this cenote flows from ponderosa where it is recorded that Mayans had once used humans as sacrifices to the gods as well as throwing gold and jades offerings into the cenote. If you feel any sparkle under the water, don’t be scared it’s just a shimmering fish moving rapidly in and out of the underwater caves. The cenote has a depth of 15 meters, and you can rent some diving equipment to try out your luck at finding any of the ancient treasure. This cenote is found in the town of Dzitnup and is one of our personal favorites! It is a beautiful cenote to go swimming and to photograph! Even though it is mostly a closed cave with just a small opening for light, there are colored artificial lights that pulsate gently through area. This leaves swimmers in the water with a relaxed, majestic feeling. The water is quite crisp and clear, and you will see some deeper areas for swimming as well as rocky and shallow areas where you can stand or sit on a rock to relax near the middle. 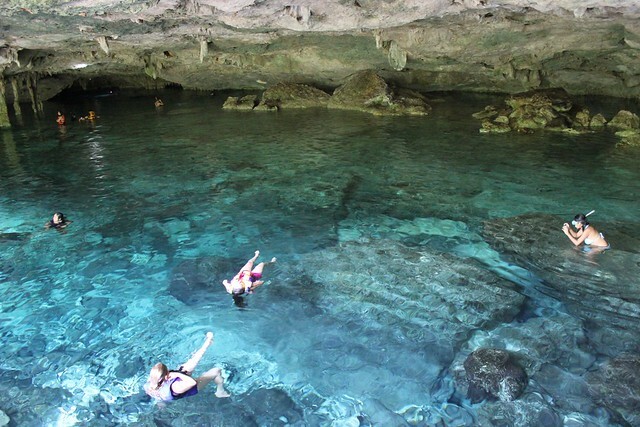 Some Yucatan and Cancun cenotes are quite commercialized, while others are more family-run. Some cenotes may have lockers and changing areas, but others will not. So to be safe, bring along with you a few essentials to each cenote you visit. Things like water, sunscreen (in case there is sun inside), sandals or travel shoes, a dry sack, and a micro fiber towel is always good. 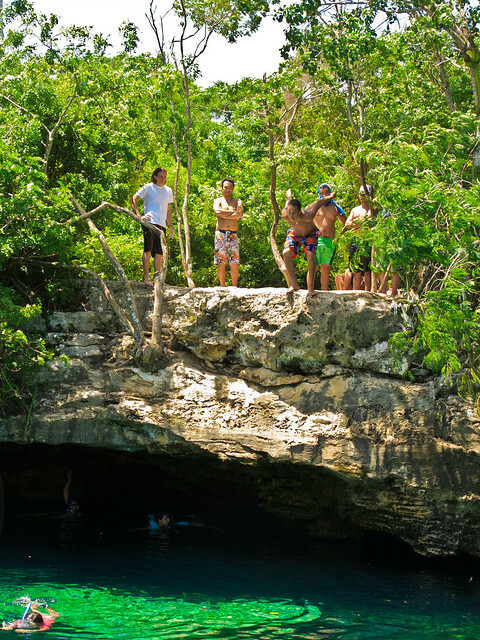 Many cenotes will have an entrance fee, but the prices vary drastically. Plan on spending around 100 pesos (equivalent to USD$8/£5 per person), but prices will vary based on popularity of the cenotes and the facilities available. Travel Tip: Beware of bringing valuables you can’t watch after closely. Not every cenote has lockers and there may not be anywhere to put your valuables that is near where you are swimming. You may also consider bringing a dry bag to put your belongings in and let it float with you in the water. Also don’t forget to bring your GoPro or underwater camera because you will definitely want to document your experience! Hi Patricia – thanks so much for reaching out to us! We do have some Cenote tour recommendations that include transportation. I’ll send you an email with some details and links to read about them.